Play 2 is completely different from the previous versions. When the team decided to change the framework I was frustrated just like the rest of the community.. “why would they change something so good” everyone was wondering! Anyway, I decided to follow the new version as I thought they would have a good reason for this radical change, and they did. Play 1.x was following the steps of django and rails, too many request serving them as fast as possible. It was working on the assumption that all request will be short (just asking for some data, or sending a form) and for more time consuming requests a scheduled job could be used. The new architecture is based on the actor model, powered by akka. Actors are lightweight entities that processes messages asynchronously. In the new Play every request is considered to be a long lasting one and it seems that the best way to handle persistent connections is the event model. Play 2.x still uses the MVC pattern. There is a Controller that handles the incoming request with the help of the Model and the View it will build and return the response. Model is of course the domain model with the data and logic and the View is the templating system that can be fed with model data to produce the response. What’s interesting about the Model is that it is completely agnostic of the view layer, well, after all that’s the point of mvc. Just like the previous version Play 2.x comes with an embedded HTTP server which specifically is the jBoss Netty and it’s non-blocking IO server. Netty is integrated into the framework and it’s completely transparent. The benefits of integrating a nonblocking IO server is that the framework provides an HTTP API that supports out of the box asynchronous web programming. When an http request comes in Netty will handle it and forward the data to play framework, the framework will processes the data and generate some response which Netty will deliver back to the client. The following image illustrates how play handles the normal requests. A client makes a request for a resource in this example the request is the following http://www.example.com/delete/234. After the domain name follows the route which is mapped to an Action in this case it is mapped to the remove action in a Controller class. The Controller has access to the model class and its methods and performs a delete on the data. The model synchronises with the database and returns back to the controller the status of the deletion (success or fail). The controller then renders the view and sends the Response to the client. The following image illustrates how play handles requests in an asynchronous way. A client makes a request for a resource in this example the request is the following http://www.example.com/delete/234. After the domain name follows the route which is mapped to an Action in this case it is mapped to the remove action in a Controller class. So far nothing has changes from the previous method. The Controller has access to the model class and its methods and performs a delete on the data but in this case the operation last longer because a lot of business rules need to be checked before deletion. To avoid blocking the Controller sends back to the client a Future[Result] and it moves on with other possible requests. At this stage the client is waiting for the actual response. The model method completes and synchronises the state with the database and returns back to the controller the status of the deletion (success or fail). The controller then renders the view and sends the Response to the client fulfilling the future results. This is a list of Scala resources to get started and beyond. * if you just want to experiment with scala there is no need to setup anything, you can use an online interactive interpreter like http://scalatutorials.com/ and http://www.simplyscala.com/. Syntax highlighting plugins are available for jEdit, Notepad++, TextMate, TextWrangler etc. http://www.tutorialspoint.com/scala/index.htm this is a tutorial for beginners. There is a free course at coursera: Functional Programming Principles in Scala don’t miss it but I suggest that you go through the basics first. Final note: all software mentioned here is open source so you can get your hands dirty.. fork them and enjoy scala. Excellent! 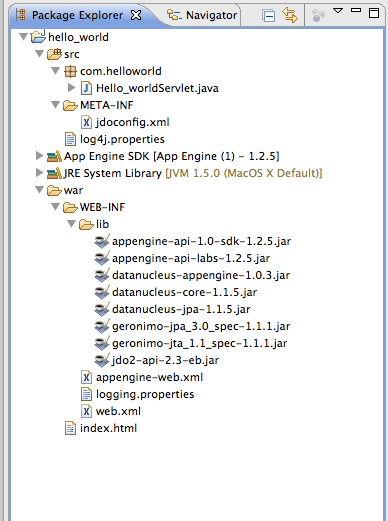 This is how java web frameworks should had been from 2005. Play is a full stack framework and has so many features that putting them all on this post it will end up being an index list. But it’s not only the long list of features it has, it’s that everything works out of the box, there is no need to figure out how to do something. As I said the list is big, so I will only list those that I found more exciting… (I am using this framework on one of my current projects and it works very well on production environment, it’s not just another experiment). Active Record style model, based on JPA annotations and backed by hibernate. This is probably the most missing feature form java frameworks, for some strange reason no other Java web framework (at least non that I am aware off) tackle this one and developers are stack with an anemic model – well this is probably a very controversial issue with pros and cons from both sides, anyway, this works fine for me and the fact that it removes the need for DAOs is a big win. Furthermore, just like POJOs you can transfer the model objects them from the service layer to the front-end and back again. No need to compile the sources, just make a change and reload your browser. Template engine, it uses Groovy as an expression language, I am not familiar with Groovy at all but I love this feature, it works just like the django templates, there is no need to know Groovy to use it. Play is modular, there are already plenty of modules to use and it’s really easy to write yours. Standard distribution of Play comes with two optional modules, CRUD and Secure. I think all projects have a need for both modules. With CRUD you have a full web administration interface for all your model objects and it’s fully customizable. Secure is a simple module that helps you setup a basic authentication and authorization management, it’s also highly customizable. Play also ships with an embedded application server, just type ”play run” and the world is ready for your next cool app, of course you can deploy your application on any application server. It’s really nice that the embedded application server is ready for production, it’s not just a subset to help you during development. Testing the app is easier than ever. It uses the JUnit for unit and functional testing, in your functional testing you can access directly your web controller objects. And there is a third kind of testing, Selenium for your views. But it does not stop there you can run your tests from your web page. In fact the tests are loaded only when you run Play in test mode “play test CoolApp”. Even more, with the Fixtures help class you can load your test data from a yaml file in no time. Do you want more! Continuous Integration to run your test auto-magically, just run Play with the auto-test command. I know what you think, you can do all these with any framework since they are not framework specific, but just imagine the time you need to set everything up, in Play they just work. Ready for REST, it is easily scaled by running multiple instances of the same application on several servers. IDE agnostic :) it comes with a command line tool that converts your project so it can be used in your favorite IDE. There are a lot more cool things about this framework. It’s very different from the rest of the frameworks in a good way, just as Spring broke the rules of enterprise development years ago, Play does the same, it breaks the rules and takes an unconventional away of doing thing which is closer to the developer, with the usability and productivity in mind. Cool URIs don’t change wrote Tim Berners-Lee more than a decade ago, URLs should be clean, usable and persistent. However, the biggest percentage of URLs around the web still are not clean and usable and even less persistent. There are lots of reasons that URLs are not persistent and most of the times it is not in the hands of the developer or webmasters, under certain circumstances some domains may not continue to be alive or they may change hands, anyway there isn’t much a framework can do about that. But for the URLs to be clean and usable is totally in the hands of the developers and webmasters. Unfortunately most web frameworks makes things even worse by not providing the mechanism to handle URLs or by making it really difficult to change the default behavior. Stripes is not one of those frameworks and it really makes it easy to create clean URLs and provides a very flexible mechanism for handling them. That’s it just one annotation and the URL is simple, more readable and makes more sense. as you can see the later is much better. You may be wondering what’s that /public over there!? When using UrlBinding annotation only the URL of those action beans that are marked by the annotation will change, the rest of the actions will still have the default URL binding as explained in the “URL Binding in Stripes“. You need to add the extension package in the filter parameters in the web.xml see “URL Binding in Stripes” for more information. From now on all the action beans will have this as default URL binding. Quite often I find myself refactoring parts of my applications for different reasons and I am sure most developers do the same thing. Refactoring a java application is relatively easy since java is statically typed language and compiler will catch all type mismatches, moreover, modern IDEs like eclipse, intelij and netBeans provide all the necessary tools to accomplish this task as easily as possible. However, there is one part of the application that java compiler and IDE tools cannot do much. This part is the JPA queries which are String literals and there is no way for the compiler to catch any changes from the model. It seems that things will change with JPA 2. JPA 2 introduces the Metamodel API (proposed by Gavin King) which is useful regardless of type safe queries. The metamodel exposes a set of interfaces which can be used to write type safe queries with the new API. Other advantages of metamodel API besides the type safe queries are that it protects from SQL injection, auto-complete support through IDE, refactoring support. Nothing impressive until now… the impressive part is how we can write the queries in a type safe way using the new criteria API. We can use the CriteriaQuery and the QueryBuilder to create the queries in the following way. String query = "SELECT m.name FROM Mixture m JOIN m.substances s WHERE s.name = :name"
This is JSR 317, here you can find all the necessary details about this cool API. The best thing about Stripes is that it follows the convention over configuration practice. One of the most convenient conventions is the automatic generation and binding of URLs to the action bean class names. During development this is very helpful since you don’t need to keep in sync a configuration file as you add or delete action beans. To generate the URLs Stripes follows certain rules, of course as with everything else in Stripes you can change the default rules if they don’t meet your needs. First lets see the default rules and then I’ll discus how to change them if needed. Stripes will automatically load all your action beans at start up, but we need to tell Stripes where to start looking for action beans, we need to declare at least one root package. We can do this by specifying the ActionResolver.Packages init-param in the declaration of the StripesFilter in web.xml which is the only mandatory configuration parameter. If you keep your action beans in different packages you can add all of them separated by comma as shown in the following spinet. Our action bean class name is HelloActionBean and it’s located under the package com.action.test; to refere to this action in a jps we can use the following name /test/Hello.action. As mentioned previously to generate the URLs Stripes follows certain rules. 1. It will remove the package name up to and including the the following names if present in the package [action, stripes, web, www]. That’s why we refer to the /test/Hello.action without the full package name since the package name of this bean includes the token action and is removed up to that token. 2. It will remove from the class name the following suffixes [ActionBean, Action or Bean]. That’s why we have the /test/Hello.action instead of /test/HelloActionBean.action. 4. It will append the .action to the end of the striped bean name. Now that we know the rules for generating the URLs, lets see how we can change them to meet our needs. This process is quite easy. The class that implements the rules for URL binding is the NameBasedActionResolver. To change the rules for URL binding you just need to extend this class and override the getBasePackages() and/or getBindingSuffix(), (if you change the suffix do not forget to change url-pattern of the servlet mapping in the web.xml). You can change completely the behavior of URL binding by overriding the getUrlBinding(String). Your custom class for the URL bind rules should be registered as a Stripes extension. Note that this is an extension and extensions are loaded automatically by Stripes but as with action beans we need to tell Stripes where to look for. To configure extensions we need to add another init-param to the StripesFilter as we did for the action beans. The parameter name for the extensions is [Extension.Packages]. Extending the NameBasedActionResolver we can tweak the URLs in any way we want and as you can see it is quite easy, an interesting tweak would be to implement clean URLs but that will be another post. Choosing a java web framework is somehow a complex process, not because they are difficult to evaluate but because there are so many of them (in fact it seems that there are more java frameworks than java developers :) but having many frameworks is a good thing. It means that there is a lot of competition and the competition seems to be healthy since most of the frameworks are open source, so competition is based on quality and features instead of marketing and lobbing. Different people have different criteria on selecting a framework and probably different needs, so I will list my criteria an the reasoning behind them for choosing Stripes. (Disclaimer: this expresses only my views on what I expect from a framework, I don’t think there are good or bad frameworks, from my point of view there are only convenient frameworks – just trying to avoid flame war here, although flame wars entertains me a lot!). I would like to start with what I consider the most annoying thing when working with a Java framework which is not other than XML configuration files. 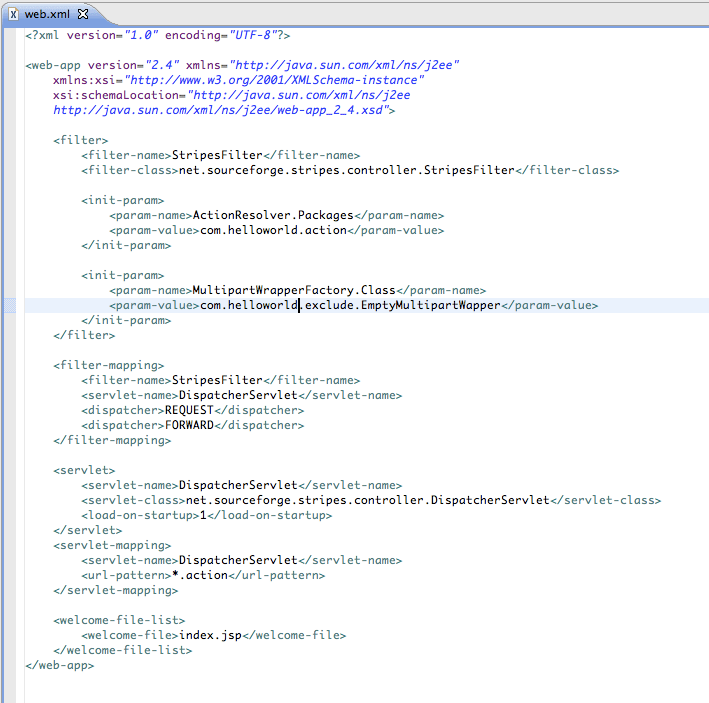 Having worked with JSF and Struts where you need to configure all your managed-beans/action-beans and pretty much everything else into an xml configuration file, which during development becomes a mess to keep it in sync, I enjoy that Stripes removes all this configuration hassle with autoloading feature. The only xml configuration file that you need is the web.xml but that is required by the Servlet specification. Configuration by exception (a.k.a convention over configuration) is the way to go, developers should focus on business solutions and not in framework configuration details that will just disturb the flow of thinking. Hopefully other framework will follow – or maybe some already does. Testing is the most important part of development and therefore frameworks should come with a build-in support for testing to make this process easy. So Stripes comes with a set of mock objects that help developers to easily write unit tests. Easy extension and customization. Stripes is designed in modular form it is quite easy to add a customization plugin to change the behavior of any part of the framework, because of this modular design the extensibility of Stripes is trivial. Actually This is one of the areas that the framework really make the difference. I don’t think that there’s a need to explain why internationalization of web application is important, all frameworks need to have a built-in support for i18n. Stripes tags comes with a default bundle lookup strategy so that i18n is just a mutter of adding key/value pairs in the resource bundle. Never trust the user input, therefore a strong and flexible validation mechanism is needed. Stripes provides a powerful validation mechanism which is based on annotations (remember there is no XML configuration). When working with request parameters the most annoying process is converting Strings to objects and vise versa, the Stripes support for this process is just amazing. But it is not just conversion there is also support for formating an object to string and that’s as easy as the conversion process. Stripes comes with a built in support for layouts, with three tags you can achieve pretty much everything. If the built in support for templating is not enough you can use freemarker. Since we are talking about web framework and web applications it would be a pity to not take advantage of Ajax. Any Ajax framework can be used due to Stripes simple and transparent request/response nature. These are some of the features that I like to see in a framework and surely you can find this features in most frameworks and probably more but the difference is that with Stripes is easy and development is fun again as the book of Frederic Daoud suggests and proves it. If you want to learn Stripes I suggest the “Stripes … and Java web development is fun again” from The Pragmatic Programmers, in fact this is the only book about Stripes but even if there were more books I am totally sure that I would suggest this book again, it is very well written and it covers everything about Stripes. The examples will be deployed on google app engine. P.S: Now that the jsr 330 is approved maybe the next version of Stripes will come with build in Dependency Injection. 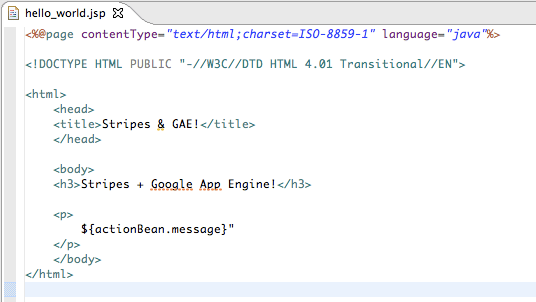 Google has created an example on how to use google app engine with java. In this example they demonstrate the basic usage of Servlet API and JDO, it’s a simple example that stores, retrieves and renders entities in google app engine. After the first tutorial on how to deploy Stripes in google app engine I decided to re-write this example using the Stripes framework of course. 7. 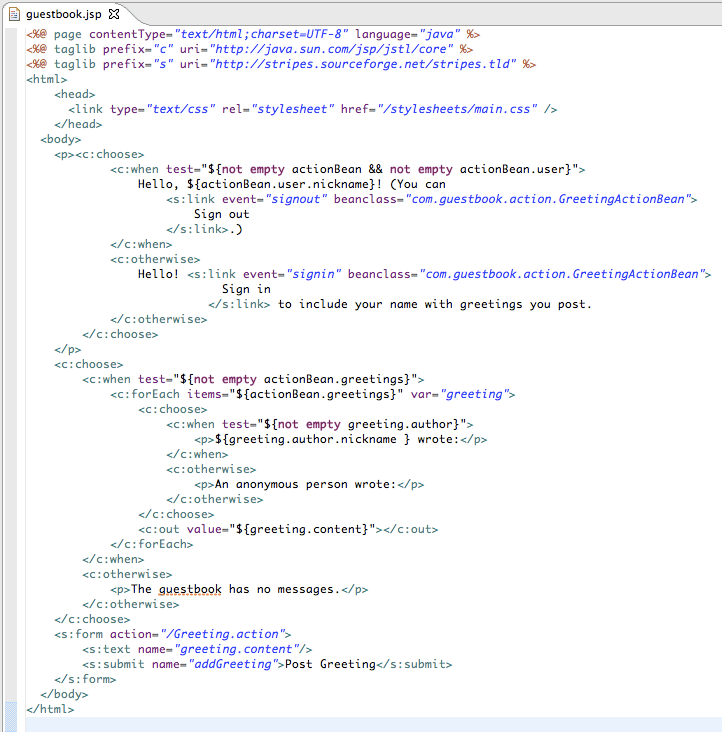 Modify the guestbook.jsp, there are a lot of changes here since in their example google uses scriptlets, I have replaced the scriptlets with jstl tags and Stripes tags, all the logic has moved to the ActionBean. This is a basic example of using Stripes Framework with the cloud infrastructure of Google. I am using Stripes in one of my projects that I am thinking to move it to google app engine so I decided to experiment before the migration. More posts will follow in this topic as I progress with it. The first objective is to create the basic project structure, configure and deploy, well… a hello world web application. This is a trivial application but there are some limitations using google app engine so trying to use the framework as is will fail with some non-sense stack traces. 2. 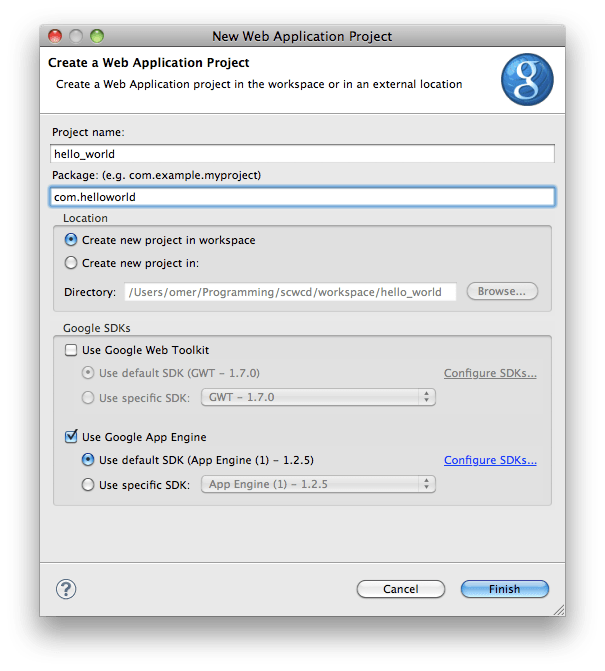 Google app engine sdk – if you use eclipse and google plugin the sdk is included in the plugin. 3. Eclipse (you can use whatever IDE or environment you like, it’s not mandatory to use eclipse, it’s just easier). 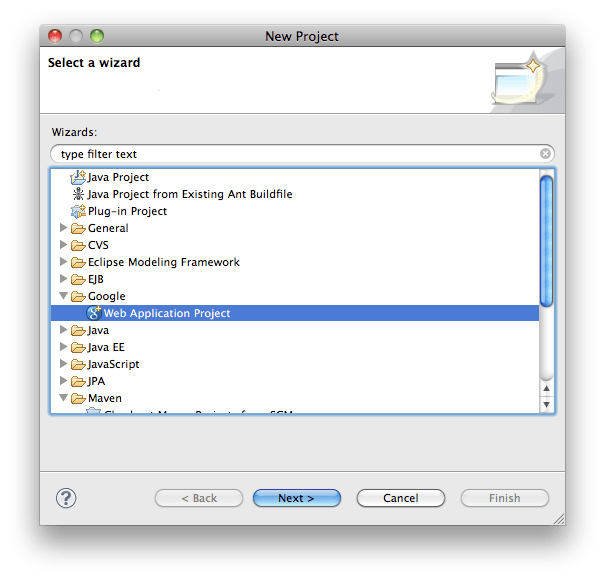 I assume you are familiar with java web frameworks and that you will use eclipse with the google plugin. Give a name to the project and an initial package name. For the moment we do not need GWT so just deselect it. After pressing finish we have the following project structure. Before continuing copy the Stripes jars in the the lib directory under hello_project/web/WEB_INF/lib and add them to the project’s build path by selecting them, right click-> Build Path -> Add to Build Path. Also copy and paste the StripesResources.properties in the directory “src” (not in a package). For the purpose of this trivial application we will only need to edit the web.xml (a.k.a Deployment Descriptor so from know on I will call it DD). By default the plugin registers the generated servlet in the DD, so open the DD and delete the servlet and servlet-mapping it’s not needed. Note that the web-app tag version has changed from 2.5 to 2.4 there are some jsp exceptions with the 2.5. The Stripes filter includes two initial parameters the ActionResolver.Packages which tells Stripes where to find the ActionBeans (more on this in next post or in Stripes documentation) and the MultipartWrapperFactory.Class, a factory class used to upload files, but uploading files is not supported by google app engine and the Stripes filter will fail to initialize. Therefore we need to disable this by providing an empty configuration. * GAE does not support file uploading so we need to disable this feature from Stripes. * The action bean that will handle the our simple request. You can delete the servlet generated by the google plugin there is no need for it. NOTE: if your application require session you need to enable it in the appengine-web.xml since it is disabled by default (but keep in mind the implication it may have in a distributed environment such as google app engine, maybe your attributes will need to implement the HttpSessionActivationListener if you plan to add them in the session). Most common tool to follow the logs of the application is tail at least under unix, linux and probably mac osx operating systems. So we just need to open a console and type tail -f path/app.log. 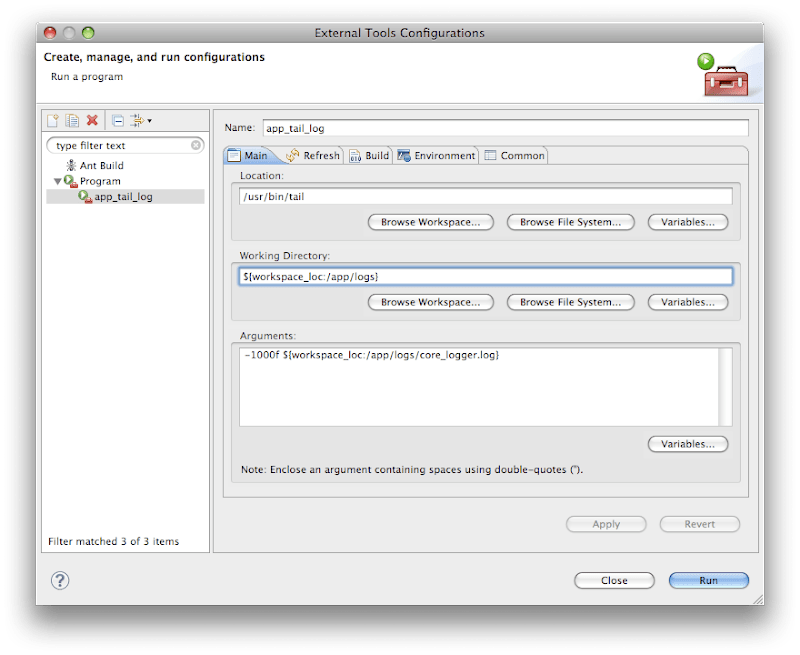 Fairly simple but it would be nice to have it inside eclipse, which turns out to be also very simple to configure it with the external tools of eclipse. Hit Run and that’s it. Windows users should install a tail for windows first!